Zofia Kowalewska made a private and personal portrait depicting her close ones, who, however, during their long lives once stood on different sides of the barricade. The film's protagonists are the documentary film-maker's grandparents. 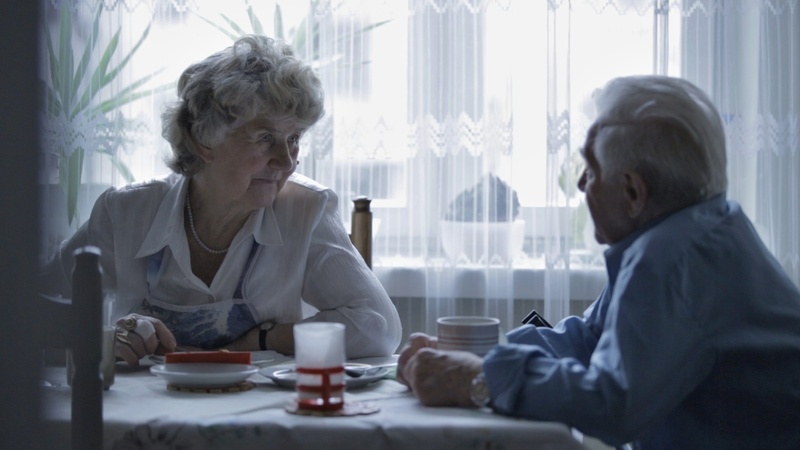 After 45 years of living together, the elderly people decide to organise a festive anniversary. At first glance, everything seems to be solemn and touching, but it has not always been like this in the lives of Barbara and Zdzisław Torhan. Eight years ago, grandfather left his wife and moved to his mistress. Therefore, the suggestion for organising the anniversary is something more than a family celebration, it is an attempt to save the relationship. And all the action takes place exclusively inside the cramped apartment. The protagonists are "spied on" mostly from the adjacent rooms or the corridor, thanks to which we can take a look at them without any interference of the camera, they are natural, and in their unhampered behaviour, they are funny and charming. Their quarrels about big and small matters create the bitter-sweet atmosphere, first we laugh when grandfather is working hard to buy his dream wardrobe which he saw in the store flyer, and then it gets more serious, when tears appear on grandmother's face. But even in such a moment, humour and contrasting tone do not disappear, as the tears on grandmother's face do not disturb grandfather in eating dinner in peace. "What really matters is that you are healthy," Zdzisław accurately comments on Barbara's tears. The greatest strength of the film "Close Ties" is precisely the fact that in her début film, Kowalewska managed to subordinate the film's atmosphere to the story and the protagonists. The credit for this should be given to the protagonists themselves, who are very colourful, cinematic characters. Under the layer of their bitter-sweet quarrels, they hide deep emotions and complicated relationships. Because "Close Ties" is first and foremost a film about people who make a difficult attempt, after many years they decide to rebuild their ties and to live together. Although their behaviour often makes us laugh, it is worthwhile to appreciate their courage and be moved by their "simple" emotions.